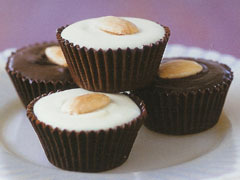 Recipe for Chocolate Almond Cups. If you like almonds, you will love these candies. Place 8 ounces of the chocolate in a 2-quart mixing bowl. In a 1-quart saucepan over medium heat, bring the cream to a boil. Pour the cream into the bowl with the chocolate. Let the mixture stand for 1 minute, then stir together with a rubber spatula, whisk or immersion blender until thoroughly blended. Add the ground almonds and blend well. Cover, let cool to room temperature, then chill in the refrigerator until thick but not stiff (2 to 3 hours). Melt and temper the remaining 1 lb. of chocolate (for tempering instructions, click the All About chocolate link below). Pour the chocolate into a paper pastry cone. Or pour the chocolate into a plastic squeeze bottle. Pipe or squeeze chocolate into sixty 1-inch foil candy cups, filling them. Let the chocolate begin to set up around the edges for 3 minutes, then turn the cups upside down over a sheet of parchment or waxed paper and let the chocolate run out. This will leave a thin coating of chocolate covering each cup. Fit a 12-inch pastry bag with a large plain round pastry tip with a 1/2 inch opening and fill partway with truffle cream. Pipe truffle cream into each foil cup to three-quarters full. Pipe the remaining tempered chocolate into each cup, filling them to the top edge. Place a whole almond on top of each cup, pressing lightly so they will adhere. Let the candies set at room temperature for 1 hour or chill them in the refrigerator for 20 minutes. In a tightly covered container wrapped in several layers of aluminum foil, the almond cups will keep for 1 month in the refrigerator or 2 months in the freezer. Serve the candies at room temperature either in the foil candy cups or on their own.